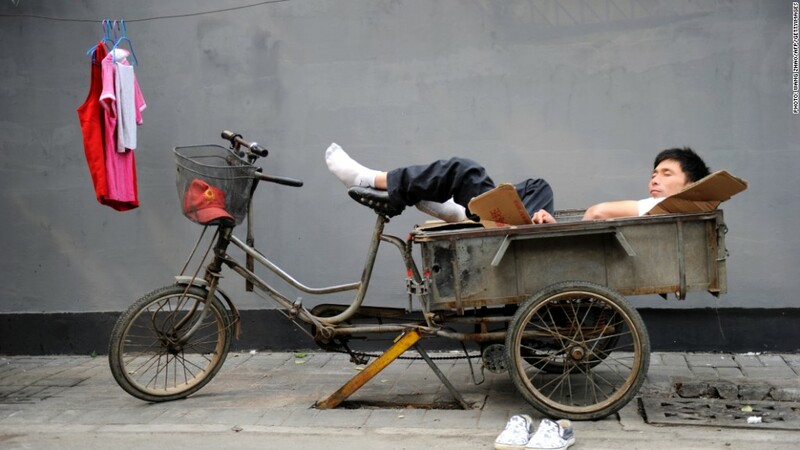 A trishaw peddler resting in Beijing, China. Spurred by a wave of disappointing data, economists are growing more pessimistic about China's short-term growth prospects. Swiss banking giant UBS has lowered its forecast for how much China's economy will grow this year to 7.5% from 8%. And Goldman Sachs has issued a slightly less dour outlook for China growth -- dropping it to 7.6% from 8.0%. The downward revisions suggest experts believe China's economy may not mount a recovery this quarter and instead would remain in a holding pattern. China's GDP grew 7.6% in the second quarter. Yet investors might be more unsettled by the banks' forecasts for next year. Economists at UBS now expect annual growth to register at 7.8% in 2013, down half a percentage point from the previous estimate of 8.3%. Goldman's forecasts show much the same, with growth now expected to hit 7.9% next year. While China is still growing fast, especially compared to less than 2% growth in the United States, it marks an uncomfortable soft patch for the world's second largest economy. Over the last three decades, China has barreled ahead at an average of about 10% a year. Among the reasons cited by economists are unreliable domestic demand for China's products, and weakness in exports, a trend brought on by Europe's economic mess and slow growth in the United States. Meanwhile, industrial production has slowed; the Chinese government reported Sunday that it grew in August at its slowest monthly rate in more than three years. The country's housing market also continues to worry policymakers. The slowdown has not gone unnoticed. China's central bank has already moved to cut rates twice this year in an effort to boost the economy. The actions -- in June and July -- were the first rate cuts since 2008. The government has pursued other stimulus measures -- an easing of bank capital requirements and an infusion of cash for local development projects. But the available data point to continued weakness. And indeed, policymakers announced a new round of infrastructure spending on Friday, with $157 billion approved for 55 projects. The projects include 25 new subway lines, as well as highway and waterway investments. "Once started, these projects are likely to filter through the economy quickly, given the strong track record of previous large stimulus packages," economists at global bank HSBC said. The investment comes at a crucial time, as China is scheduled to undergo a leadership change in coming months that will reshape the top ranks of China's government and the ruling Communist Party.